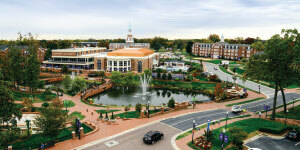 High Point University is located in North Carolina on the East Coast of the United States. We are in High Point, a city with a population of 100,000. High Point is a member of the Piedmont Triad, an area with a population of more than 1.4 million people. Global companies in the area include AT&T, Honda Aircraft, Polo Ralph Lauren Corporation, Procter & Gamble, the Volvo Group, Federal Express, and many others. GEOGRAPHIC DIVERSITY: Our current student body represents all 50 states and 37 countries; 99% of freshmen live on campus, and 95% of students live on campus all four years. INTERNATIONAL STUDENT SERVICES: The Office of International Student Services provides a variety of resources for international students. Please visit highpoint.edu/oiss for detailed information. Students scoring below these requirements may be conditionally admitted and required to take our ESL program. By focusing holistically on students’ transformational educational journeys, HPU attracts students from all 50 states and nearly 37 countries. 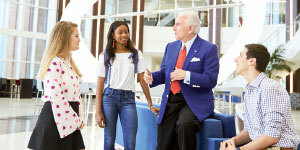 Since 2005, President Qubein has led a $2 billion investment in academic programs (five new academic schools have been added) and student-life facilities. New buildings include two student centers, 10 residential communities, a lacrosse/soccer stadium, a Division I athletics complex, and, currently under construction, a 4,500-seat basketball arena, conference center, and hotel. 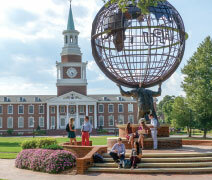 Beyond academic excellence, HPU also focuses on values. President Qubein often remarks that High Point University is a God, family, and country school. While all backgrounds are welcomed and celebrated on this inclusive campus, HPU appreciates and promotes the values of hard work, service, patriotism, private enterprise, joy, and generosity, among others. Each year, HPU hosts 1,000 local military veterans to express gratitude for their service to our nation. In December, HPU welcomes more than 20,000 visitors to campus for a two-night Community Christmasevent, complete with a life-size Nativity, falling snow, and Santa, who offers a gift to each child. The entire event is complimentary.